In 2013, Angelina Jolie’s double mastectomy and publication of her personal treatment choice for BRCA1 positivity generated considerable media attention. To the authors’ knowledge, the current study is the first prospective survey conducted among the general public to measure a quantifiable media-related effect on public awareness. The authors analyzed the changes in the general public’s awareness of reconstructive options in breast cancer among 2 female population-matched cohorts aged 18 to 65 years (1000 participants in each cohort) before (March 2013; poll 1) and after (June 2013; poll 2) the announcement of Ms. Jolie’s mastectomy in May 2013. There was an observed increase in public awareness: significantly more women from poll 2 were aware of reconstructive breast surgery being possible after breast cancer-related mastectomy, notably with regard to autologous tissue and single-stage reconstructions. Approximately 20% of the women in poll 2 (205 women) indicated that media coverage regarding Ms. Jolie affected their interest in breast cancer. A question that was exclusive to poll 2 revealed a preference for autologous (66.2%) versus implant-based (8.2%) reconstructions, with the remainder indicating no preference (25.6%). None of the stratification variables were found to be associated with the above findings. To the best of the authors’ knowledge, this is the first prospective study to demonstrate a statistically significant impact of a celebrity announcement on public awareness regarding breast cancer treatment. The results underscore the importance of a media-related impact for professionals in the health care sector, which can serve as a tipping point for raising awareness and improving knowledge concerning a specific disease among the general public. via The Angelina effect revisited: Exploring a media-related impact on public awareness – Lebo – 2015 – Cancer – Wiley Online Library. Thousands of women with early but aggressive breast cancer could benefit from a drug that has been approved by UK regulators, say experts. 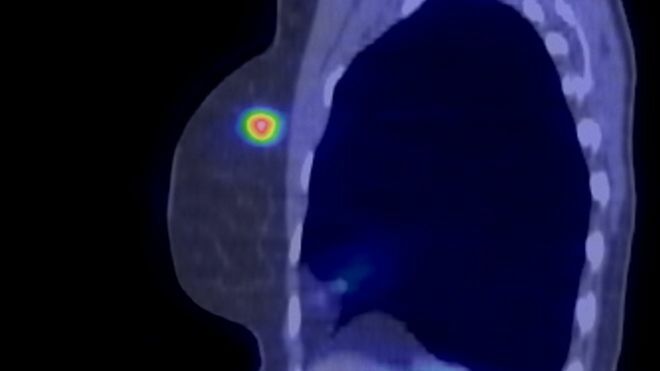 Pertuzumab (Perjeta) fights HER2-positive breast cancer and its new licence means it can be used before surgery to shrink and control tumours. It was already licensed for advanced breast cancer. According to manufacturer Roche, the drug could help more than 1,800 patients a year in the UK. About 15% of women with early-stage breast cancer have HER2-positive tumours. These tumours have a higher-than-normal level of a protein called human epidermal growth factor receptor 2 and tend to grow more quickly than other breast cancers. Therapies such as pertuzumab can target this receptor and interrupt signals that tell the cancer to grow. The medicine has not been recommended for widespread use on the NHS by the watchdog NICE or the Scottish Medicines Consortium, but patients in England with advanced breast cancer can obtain it through the government’s Cancer Drugs Fund. When used with trastuzumab (Herceptin) and chemotherapy, pertuzumab can keep people cancer-free for longer, as well as reducing the chance of the cancer spreading. And because the drug can shrink tumours, she said, some women would be spared mastectomy surgery. via Breast cancer treatment: Drug pertuzumab licensed – BBC News. Over view from the Guardian via Aspirin ‘may double life expectancy of cancer patients’ | Society | The Guardian. A daily dose of aspirin can double the life expectancy of patients with cancers affecting the gastrointestinal tract, according to a study. It was already known that that frequent use of aspirin can prevent bowel cancer, but the most recent study also suggests that men and women with a range of cancers who take the anti-inflammatory painkiller experience a significant survival benefit compared with those who do not. The study of 14,000 cancer patients in the Netherlands found that regular users of aspirin were twice as likely to still be alive after a four-year period as those who did not take the cheap drug. According to the report’s authors, the impact of aspirin on survival was seen after adjusting for factors such as gender, age, stage of cancer, treatments, and other medical conditions that could have influenced death rates. Conference abstract via Searchable Programme for ECC2015. Epidemiological evidence shows a dual role in the relation between aspirin and cancer; both preventative and therapeutic effects are suggested. The biological mechanism of aspirin is still part of debate. Stratification in specific localizations in the entire gastro intestinal tract could lead to new insights towards the effect of aspirin as a therapeutic agent. Previous research focused mainly on the effect in colorectal cancer. The objective of this retrospective cohort study is to determine the association of aspirin use solely post diagnosis and survival for all distinct gastro intestinal malignancies. All patients with cancer of the gastro intestinal tract diagnosed between 1998 and 2011 were selected from the population-based Eindhoven Cancer Registry and linked to drug dispensing data from the PHARMO Database Network. The association between aspirin use after diagnosis and overall survival was analyzed using Cox regression models with time-varying exposure. Aspirin use was recorded in periods of use and no use per patient. Relative survival was estimated, defined as the ratio between the observed survival in the cohort and expected survival in the general population. In total, 13.715 patients were diagnosed with a gastro intestinal malignancy, 4.187 (30.5%) used aspirin prediagnosis, 1.143 were solely postdiagnosis users (8.3%) and 8.385 (61.1%) were non-users. For this analyses, solely postdiagnosis users and nonusers were selected(n=9.528). The largest groups were colon (4081; 42.8%), rectal (2370; 24.9%) and esophageal (972; 10.2%) cancer patients. Median follow-up time for all patients was 26.5 months (range 0–180.7) with a five year overall survival of 56%. In total, 5.440 events were reported. Overall and relative survival for aspirin users will be presented at the congress. Aspirin use initiated after diagnosis of gastro intestinal malignancies is associated with higher overall and relative survival rates. In January 2015 the Aspirin trial started in the Netherlands. This phase III multicenter, placebo-controlled, randomised trial will study the effects of aspirin on recurrence and survival in elderly patients with stage II and III colon cancer. More than half of people invited to take a new bowel cancer screening test didn’t take up the opportunity — even though it could stop them developing or dying from the disease, according to a Cancer Research UK report published in the Journal of Medical Screening. Cancer Research UK scientists found that people from poorer neighbourhoods were less likely to take up screening, with only one third in the most deprived neighbourhood going for their appointment compared to over half in the most affluent. Researchers looked at how many of the 21,000 people in six pilot areas of England, who were sent an appointment, did not go ahead with the new test. In the most ethnically diverse area, 39 per cent decided to have the test compared to 45 per cent of people in the least ethnically diverse area. And more men (45 per cent) took the potentially life-saving test than women (42 per cent). Rethinking Cancer, a new report by the International Longevity Centre- UK (ILC-UK) quantifies the cost of cancer to the UK economy, its families and its communities. The independent report presents research on the economic and societal impact of cancer. The report considers the wider cost of cancer alongside the 160,000 deaths it causes each year in the UK. In a single year over 50,000 people of working age lose their lives to the disease and in 2014 these people could have contributed £585 million to the UK economy. The 1.8 million people living with and beyond cancer in the UK contribute approximately £6.9 billion to the UK economy each year through paid employment. The wider societal contributions of cancer survivors are significant and have been valued at £15.2 billion per year. This includes providing hours of informal care to others, along with voluntary and domestic work. ‘Rethinking Cancer’ outlines the changes required to increase survivorship and better support those living with and beyond cancer, their employers, families, friends and relatives. The report reveals that the gap in cancer survival rates between England and the European average has remained at around 10% for the last two decades. ILC-UK calculate that closing the gap would contribute £117 million to the UK economy. Rethinking Cancer finds that if employment rates for cancer survivors were the same as for the rest of the population cancer survivors would contribute an additional £4 billion to the UK economy each year. The National Audit Office has published the findings from its Investigation into the Cancer Drugs Fund. The government set up the Fund in 2010 to improve access to cancer drugs that would not otherwise be routinely available on the NHS. The key findings of this investigation include: the Fund has improved access to cancer drugs not routinely available on the NHS; 51% of the patients supported by the Fund between April 2013 and March 2015 accessed drugs that were appraised by NICE but not recommended for routine NHS commissioning; due to a lack of data, it is not possible to evaluate the impact that the Fund has had on patient outcomes, such as survival; NHS England has taken action to control the rapid growth of the cost of the Fund, including removing drugs on the grounds of cost; and all parties agree that the Fund is not sustainable in its current form.